The TCF-S has a new big brother - the TCF-S3. 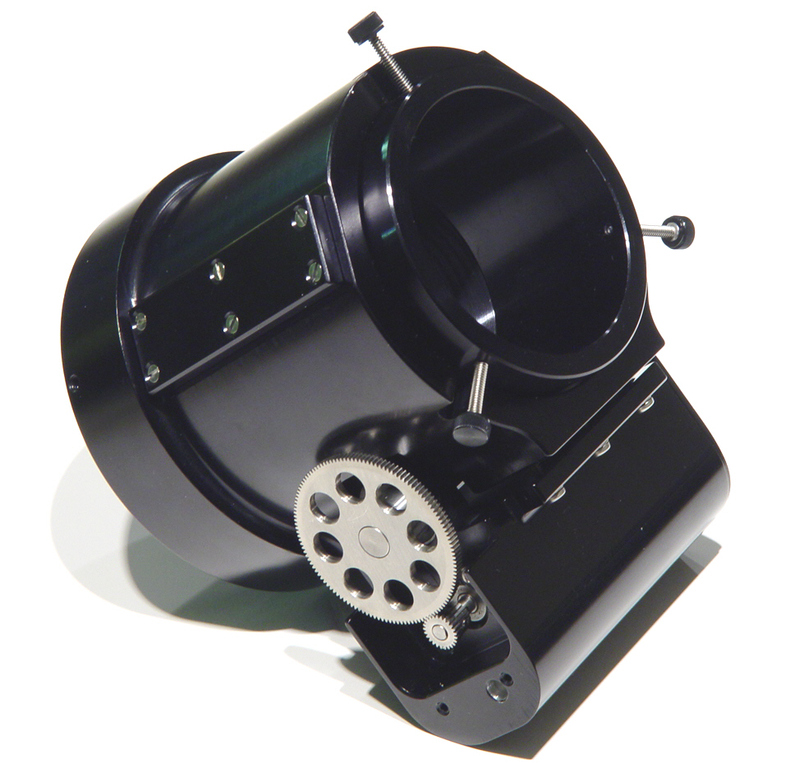 This 5 pound focuser has all the same features of the TCF-S but is just bigger and stronger. With the ever-increasing size of CCD cameras and associated instruments, the need for a precision digital focuser that can take the weight and is compatible with most of the camera control software available is now met. No corners were cut with this model. The massive drawtube has a 3.00-inch I.D. and is made from 7075, the strongest of the commercial aluminum alloys. To prevent any slippage common to Crayford style focusers, the drive rod is pressed onto the drawtube with a force of about 500 pounds. The TCF-S3 can take this extreme pressure because the drive rod is made from a ground bar of high speed steel with a diameter of 0.375 inch. Hardened rails of stainless steel are embedded in the drawtube to engage the drive rod and take the strain. TCF-S3 with gear cover removed. All gears are made from 303 stainless. The total linear travel of the drawtube is 1.00-inch with a resolution of 0.0001-inch. Like the TCF-S, a control box with IN and OUT pushbuttons, serial computer interface and digital display control all functions of the TCF-S3. All other features of the TCF-S3 are similar to the TCF-S. It uses the same cables, temperature probe and the new remote keypad. It is also compatible with the current Optec control software TCF-S.exe. 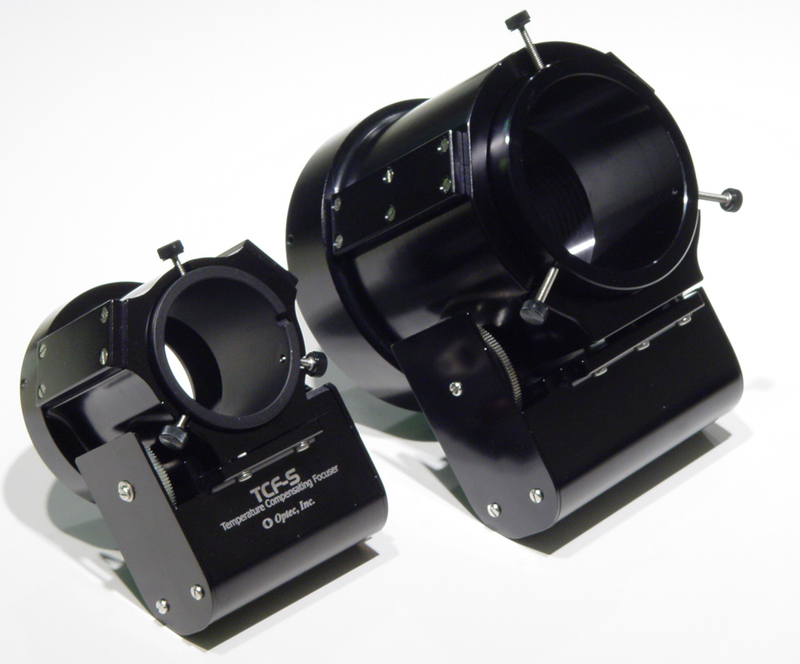 Other telescope mounts can be made custom in our shop. This focuser is only intended for large scope with massive mounts. See price list for a list of available mounts. A 3-inch to 2-inch adapter is available to fit Optec and other standard 2-inch accessories. TCF-S3 with standard accessories that include controller, temperature probe and power supply (not shown). 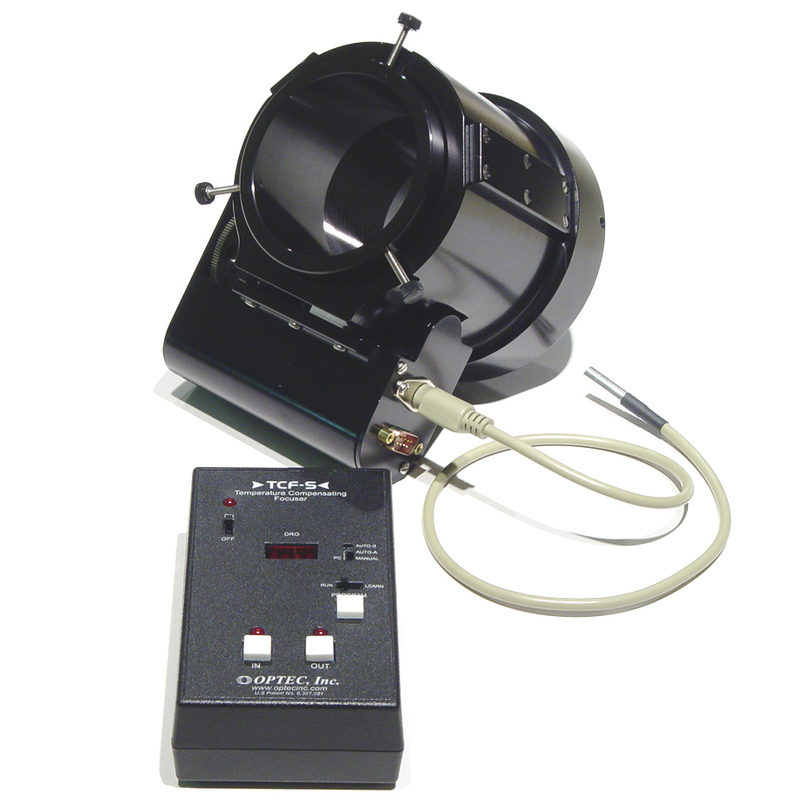 For owners of the Paramount ME, Optec offers a special kit that can conveniently wire the TCF-S3 through the mount. In addition, both the IFW and Pyxis can also be mounted and wired through the mount for easier use and less cables. Click here to download more information. Optec,Inc. © 1996, 2012 | All Rights Reserved.